Charming West side home on over a half acre park-like lot. 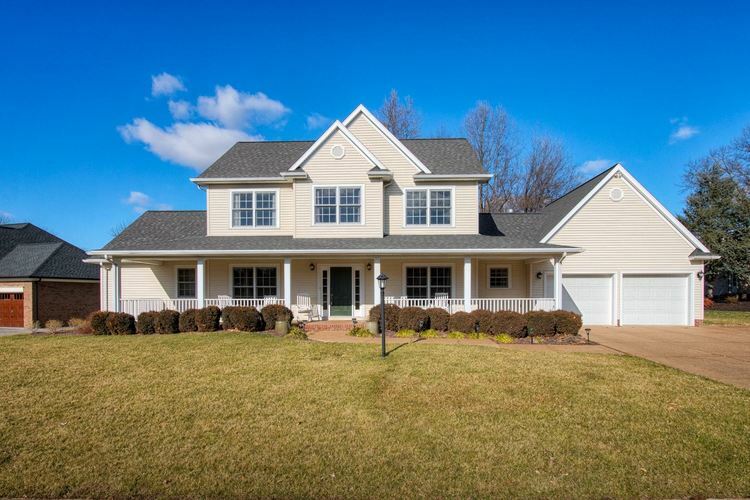 This home greets you with a terrific 51' covered front porch. Plenty of parking with wide 3rd pad. Back yard has mature trees and a creek at the edge of the property. Professional landscaping and irrigation with separate meter keep the yard looking good. Inside this home is move in ready! Living room/den/office/play room and formal dining room are in the front of the house. Family room is open to the kitchen and both overlook the backyard. Family room features wood laminate flooring, gas fireplace, built in cabinets, and door leading to patio. Bay window in eat in kitchen includes breakfast bar, appliances, tile backsplash, planning desk, pantry. Half bath and laundry room conveniently located behind the kitchen. Master bedroom suite has trey ceiling with recessed lights, double sink, jet tub, separate shower, walk in closet. Upstairs are 2 bedrooms each with 2 closets and a very large 4th bedroom/bonus room that could easily be split into 2 rooms if a 5 bedroom home was desired. This home has a lot of closets, and 400 sq ft of floored and lighted storage in the attic, accessible from bonus room and garage. Home warranty included.